The vast majority of King salmon farmed in New Zealand, are raised in ocean pens in the Marlborough Sounds, Stewart Island and Akaroa. The farms are located in areas selected for their isolation, water quality and flow. Farm site selection is so critical that only a handful of sites around the country are considered suitable for salmon operations. A New Zealand farmed King salmon starts life in a fresh water hatchery where it will remain until around 8-13 months before being transferred to a salt water farm. These sea farms are designed specifically for New Zealand conditions with pens up to 24m deep. The depth of the pens offer improved growing conditions allowing the fish to move below the surface water and away from surface related stress. The sea pens used are made of netting and are around 18,000 cubic metres in size and result in low stocking densities, ranging between less than 1 kg/m3 up to around 25 kg/m3 (depending on the life stage of the salmon). After being placed within a sea water farm, a young fish will generally take 19 – 31 months of further nurturing to grow to an optimum market size of around 3.5 – 4 kg (7.7-8.8 lbs) and ranging up to around 6 kg (13.2 lbs). New Zealand farmed salmon are fed food pellets specially formulated for King salmon which contain no growth promotants. 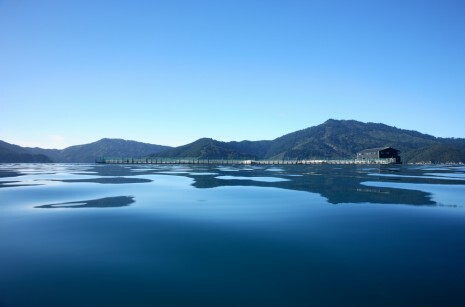 The New Zealand Salmon Farmers Association follows world-class Finfish Aquaculture Environmental Codes of Practice, and farms are managed to meet rigorous resource consent conditions.